Hello everyone! First of all I want to make you sure, we have no summer break! As I’m maybe a little less active on my social media accounts in these days, in fact it means more work, more experiences and a lot of valuable moments that are important, not only for my rally life! Since the finish of the Rally Bohemia, I‘ve spent most of the days at Kresta Racing Workshop, becoming even stronger about technique of a Skoda Fabia R5. And I’m persuaded, I take a huge advantage for the future! Another experience that I want to share with you, was a 3-day gravel test, organized last week for a well-known Polish driver, in which I took part in as a member of KRESTA Racing. All used roads were held at the north of Poland and the team decided to use my usual chassis. Actually, what is the most important thing from my POV, I had a chance to drive the Fabia R5 at the end of the 3rd day, for several, very helpful kms. And as you probably think right, it’s been an unforgettable moment for me. First time with 4WD car on gravel and after several rallies with R5 on asphalt, something really new for me! 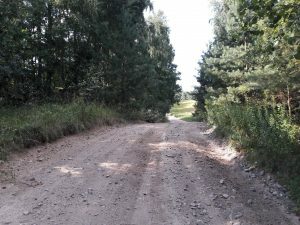 Finally, gravel has given me a lot of topics and ideas to wonder about, not just about driver’s technique, but also my pacenotes, brake points – that go hand in hand with the grip, or the choosing the line in some kinds of places. A key person has been once again Roman Kresta, who’s helped me a lot again! Thank you Roman. I’m sure, this experience will move me higher, not just on a gravel. But I hope already on Barum Rally. Honestly, the questions, which I’ve brought from the test, are now the most discussed matter inside my head! We are also intensively planning the second half of the season, which will kick off the most famous and the most difficult rally in the Czech Republic – Barum Rally. The event takes place later this month. In these days, every member of the team is working for 100% to prepare for the highlight of the season. And basically, we know, we will make our further plans according to our result at the Barum Rally! After round 5 from 7, we keep the P2 in the provisional standing of the Czech rally championship, right behind SKODA factory crew Kopecký – Dresler. And there’s a great amount of points to reach at the Barum Rally! Be sure – we are gonna fight for them with all our strength! Finally, I am happy to confirm, we will take part in the Barum Rally as a part of the ACCR Czech Team! It also means in ERC field, and for sure as a competitor in ERC Junior U28! We cannot wait, the countdown already started! And how do you enjoy your summer so far? Are you gonna visit Barum Rally to support us? Feel free to let me know in comments bellow!